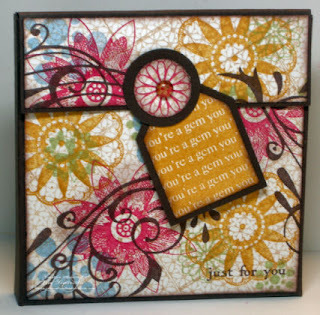 The Design Team at Innovative Stamp Creations was issued a challenge by Betsy to create a box, and something to go into the box using only the images from the Fansy Designs Plate. Inspired by the Color Collage technique from the April TJNL, I created my own patterned paper using images from the Fansy Designs plate. To create the base piece for my stamped images, I repeatedly stamped the small square flower image in Creamy Carmel on white card stock. I continued to add my other images using Rose Red, More Mustard, Certainly Celery and Bashful Blue, and Chocolate Chip inks. When finished I edged my white card stock using a sponge dauber and chocolate chip ink. 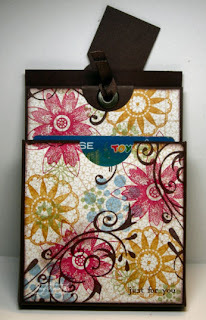 The Tag image from this plate fits perfectly with Stampin' Up! 's tag punches, here I stamped the image in More Mustard and layered it on Chocolate Chip. In the center of my stamped flower, I've added a brown Dew Drop. Now what to put inside the box??? I thought this box would be great for gift cards - I stamped my paper for the inside that holds my gift card to match the outside of the box. I added a 1 1/4" circle punch to the center with a Jumbo Eyelet and tied on some Chocolate Twill. I used my Slit Punch hold my gift card. Note: If you decide to make this box - remember to punch your circle in your box base before you assemble. Click here for the box pattern. Wow! The patterned paper you created here is gorgeous!! Love the box too! This is going into TODAY'S FAVES! The DP you created is awesome! I've been thinking about subscribing to the TJNL. I tried clicking on the box pattern link and it's not working for me - did it come from TJNL too? The pattern should open up a MSWord Document -make sure your pop up blockers are turned off. No, the pattern is not from the TJNL - I was given dimensions by Betsy at ISC and drew the pattern. I love these somewhat primary colors with the distressed look. This is funky and fresh. Technique Junkies is Fantastic and worth every penny. The contributors, INCLUDING Lisa, are absolutely amazine! Gorgeous color combination Lisa! What a great box and gift card holder.......... I hope to be able to give this a try!